The budget will not be drafted in public. In fairness, he’s not lying. But it won’t be drafted in Kildare Street either. Nor will it ever again be drafted in Ireland. This budget will be drafted in Brussels and rubber-stamped in Frankfurt. Welcome to the post-Yes world. This is what we voted for. Of course, given the abject failure of this government to address the country’s economic woes – principally caused by the bank debt, whatever the spin doctors might say – this one was a fait accompli long before we voted yes a few weeks ago. There will be more savage cuts to services. There will be more tax rises. Fine Gael has even instructed its TDs not to speculate on its contents and that they would be given an “opportunity to offer their thoughts” later – the notion that FG backbenchers will be asked what they think of any measures contained in it is utterly laughable. For “speculate”, read “debate” or “question.” Neither will be tolerated, and we can expect several months of Brian Hayes spewing party-fed guff about economics, and why we should all beat the cost of his cowardice. The job of Fine Gael’s backbenchers, as it was in the recent referendum, is to nod sagely at matters they don’t understand and cannot influence. It it the illusion of democracy as practiced in Ireland. Anyone who questions the logic of the budget proposals will be once again asked where the money will come from, or who will pay the nurses and the gardaí and the teachers. In a remarkably display of political stupidity, one TD has taken it upon himself to pay a teacher’s salary out of money paid to him by the state. Some see this as a great act of altruism, when in fact it is one of the most craven acts of political cowardice in a country not lacking candidates. Shortly afterwards he hired his wife to a job paid by the state without even bothering to create the illusion of fairness by interviewing anyone else. As if that wasn’t enough, he is now clawing back the €46,000 he pledged to give back to the state – an election gimmick – to pay a teacher whose job would otherwise disappear thanks to cuts imposed by his government – another election gimmick. This is no great altruistic act on his behalf – it is a simple, grubby, vote-buying exercise. To make matters worse, he is essentially buying another election with the same €46,000, at the same time as he is admitting that the policies of his government are grievously wrong. Instead of installing a teacher in his constituency, Griffin could have showed some courage and voted against the cutbacks and against the poor having to bear the brunt of losses not incurred by them. He didn’t do so. Instead, he chose to insure his political future using your money. I arrived back from Ukraine yesterday (I learned quickly not to call it “the Ukraine”, as apparently they take offence), where I walked past the tented village protesting at the continued imprisonment of Yulia Tymoshenko every day. It is a beautiful place, full of tough, creative, resilient people, but if ever there was a country both defined and hampered by corruption, Ukraine seems to be it. ANd the higher up you go, the more corrupt it gets. My good friend Pelle Blohm was there for a few days too, and he told me of an interesting conversation he had with a tour guide about the political situation. With the likes of Griffin pulling strokeslike this, Ireland is going thew same way. 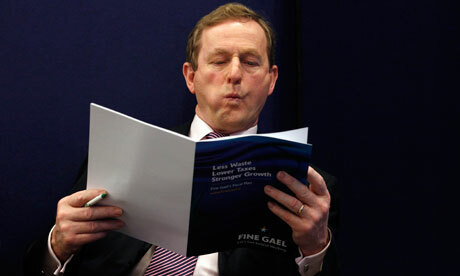 And with Spain going under and Cyprus asking for a bailout, Kenny will soon have to deliver another austerity budget. With his own backbenchers unwittingly showing their hand, his time will soon be up. Luckily for him, events will overtake his gullible stupidity, and history will simply remember him as the mewling, cowardly fool who hitched Ireland to the listing ship of the Euro, just before it sank without a trace.